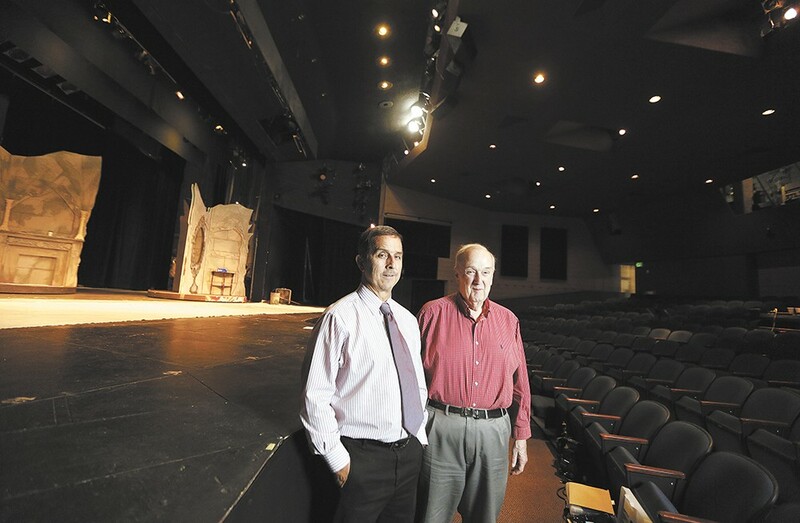 Spokane Civic Theatre CEO Mike Shannon, left, and Interim Artistic Director Jack Phillips. Something creatively wonderful was happening here about seven decades ago. The horrid years of war had finally come to an end, and life in America — and in the city of Spokane — seemed prosperous again. The troops had come home, started families. People began to feel they could let loose a little, and the urge for creative expression didn't seem so frivolous with World War II finally behind us. So on Dec. 18, 1945, a man named Harold Paul Whalen conducted the first concert of the Spokane Philharmonic Orchestra inside the elegant walls of the Masonic Temple. That legacy lives on through what we know as the Spokane Symphony, which celebrates the start of its 70th official season this fall. Around the same time, a group of avid local thespians, led by Betty Tomlinson, gathered and began what would become the Spokane Civic Theatre, officially founded in 1947 and also entering what it considers its 70th season this month. Over the past seven decades, both of these performing arts nonprofits have established themselves as respected beacons of creativity and talent, attracting some of the best musicians and actors to our region who desire to share their passions with the community. "I think one of the reasons why we both have survived is that both the Civic and the Symphony have discovered that there are extraordinarily talented people here in the Inland Northwest," says Jack Phillips, the Civic's current interim artistic director who also led the organization from 1991 to 2004. He's been back for the past several months helping the theater transition to its new artistic director, Lenny Bart. "Because of the level we have worked, we keep attracting people to come in and work for us, and that keeps building the amount of talented people," Phillips continues. Leading the Civic with Bart is new CEO Mike Shannon, as the Civic enters into a new form of dual leadership, with both a CEO and an artistic director. In the Symphony, principal trumpet Larry Jess offers similar sentiments regarding the region's talent base. As the most senior member of the orchestra, performing continuously since 1969, Jess has seen much change over the years. He's worked under six different conductors — all but Symphony founder Whalen — and has watched the organization adapt and change to meet the needs of both its musicians and the community. "When [music director] Eckart [Preu] found out, he said, 'I can't believe how long you've been there,' and I said, 'Yeah, I've seen a lot, but I've gotta say this is the best orchestra,'" Jess says, emphasizing, "Really, across the board it's the best it's ever been." Over the years, both the Symphony and the Civic have also indirectly birthed other creative offshoots that have continued to contribute to the Inland Northwest's cultural vitality. Similarly, both of the nonprofits have continually supported each other, collaborating for events like the 2014 performance of Les Misérables at the Fox Theater. Many of the Symphony's musicians often contribute to the Civic's productions as members of the live orchestra. That's where Jess got his early start, performing for the theater's 1967 production of West Side Story. After 70 years entertaining the Inland Northwest, the Civic and the Symphony each look forward to another seven decades as exemplars of artistic excellence. Getting to where they are today has not been an easy journey, yet to add another seven decades to their storied histories, both groups say that support from the community — through ticket sales and donations — is crucial to their future success. The Symphony's 70th season, titled "Sensational, Magical, Instrumental," kicks off this weekend with the first of more than 25 concerts scheduled for the full season. That busy slate includes the 10 Classics series concerts, which highlight work by both the great masters and contemporary composers, along with the variety-centric SuperPops series, Chamber Soirees at the Davenport Hotel, the happy-hour themed Intersect series (formerly Symphony With a Splash) and many other performances. On the drive from Illinois to Spokane a few days before the Civic's 70th season opening gala, the incoming artistic director expresses excitement to be joining the organization, having heard many positive mentions of its respected status, including its success over the years in the American Association of Community Theatre's annual ACCTFest. Bart brings a wealth of experience, having worked for numerous theater arts organizations, including a role as the managing director of the Quincy (Illinois) Community Theatre. As he begins his tenure with the Civic during this landmark season, which features 14 fully staged productions, Bart says his primary goal "will always be to present the highest quality product that we can with our facility and our budget."